Popular military historian Victor Davis Hanson opines that "the entire notion of American strategic doctrine," right up to the present, shows the distinct influence of a mercurial, fiery-tempered Union general who cut a devastating swath of destruction through the South during the Civil War. Ever since, William Tecumseh Sherman has remained one of the most revered, despised, controversial, and influential military figures in American history. Matthew Carr declares that his intention is to decipher "What exactly did that strategy consist of and to what extent have America's subsequent wars followed the template that Sherman created." In pursuit of his quest, Carr has written a unique, albeit oddly frustrating, book. He clearly is not interested in writing a conventional military biography or a "myth and memory" exegesis. 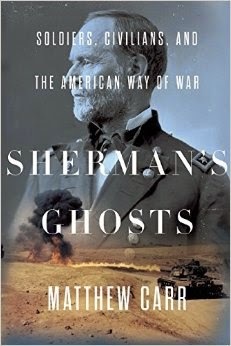 Indeed, much of the book deals with military events occurring long after Sherman's death. Carr find's Sherman's ghosts haunting American military policy and actions from the Spanish American War to Iraq and Afghanistan as part of what historian Russell Weigley has called "the American way of war." Throughout the book, the reader is challenged to consider whether Sherman is the "Great Destroyer" and maker of war on innocent women and children as portrayed in Southern Lost Cause mythology or "the first modern general" on a moral crusade using methods that sought to avoid needless slaughter of his soldiers while adumbrating modernity's propensity to wage war on civilians in an attempt to break their morale behind the lines, thus weakening military operations at the front. Or perhaps Sherman was that rare personage who defies categories because, in fact, he is greater than the sum of his parts. Carr posits a bold conclusion and uses a broad landscape in his attempt to establish the roots of America's modern war machine in Sherman's invasion of the old Confederacy. For Carr, "Sherman embodies a very specific use of military force as an instrument of coercion and intimidation that has often replayed by the U.S. military and also by other armies." Understanding the evolution of this doctrine, Carr maintains, can "tell us a great deal, not only about the Civil War and American war making, but also about the evolution of modern war into attacks of unprecedented violence against civilians." The first third of Sherman's Ghosts summarizes his modus operandi. In a September 1863 letter to Union Chief-of-Staff Henry W. Halleck, Sherman declared his intention to wage war not only against opposing armies but also against Southerners who "stand by, mere lookers-on in this domestic tragedy, they have no right to immunity, protection, or share in the final results." Clearly, warfare inflicted upon civilians was nothing new; it had been practiced at least since the Trojan War. Indeed, Zachary Taylor's volunteers savaged civilians during his invasion of Mexico in 1847. Sherman, however, made destruction of civilian property and its effect on morale an integral part of his overall military strategy. Property, not lives, was Sherman's objective. Part Two of Carr's book attempts to deal with Sherman's legacy in the 20th century and beyond. Here's where things get muddled. In America's first post-Sherman war (leaving aside the genocide committed against Native Americans on the western plains) occurred in the Far East against another people of color. The Philippine War of 1898-1902, Carr posits, "bore the direct imprint of Sherman's campaigns in terms of both strategy and personnel." This may be true in terms of Sherman's harsh tactics against Southern guerrillas early in the war, but it certainly is a stretch to compare the wanton destruction of property and torture of fighters, suspects, and sympathizers of the armed insurrectos of Emilio Aguinaldo's Army of Liberation to Sherman's march through Georgia and the Carolinas. It's hard for even Sherman's harshest critics to imagine him saying (as Brigadier General Jacob H. Smith alleged to a subordinate during "pacification" operations on Samar and Leyte): " I want no prisoners. I wish you to kill and burn, the more you kill and burn, the better it will please me." The perversion of Sherman's dictum that "war is hell" is evident in the statistics. In the last major military operation of the war, 4200 American soldiers died. In contrast, 16,000 to 20,000 guerrilla fighters died. Civilian deaths, Carr maintains, "has been variously estimated from 200,000 to a million, either as a direct result of military operations or from war-related hunger and disease." This may have become America's way of war, but it certainly wasn't Sherman's. Carr rightly maintains that "The particular hellishness of the Vietnam War owed more to the innovations in U.S. counterinsurgency strategy than it did to Sherman's campaigns." There, like in the Philippines, body counts and kill ratios were the determinants of success against an enemy fighting an unconventional war. Even in so-called conventional wars, Sherman's strategy of destroying an enemy's economic infrastructure, clearly his intent in Georgia and the Carolinas, became twisted in America's military psyche. In an attempt to avoid the bloody stalemate on the Western Front in World War I, military strategists sought an economic solution similar to Sherman in Georgia and Sheridan in the Shenandoah Valley. British military theorist B.H Liddell Hart, a Sherman fan, authored The Strategy of Indirect Approach and opined that Sherman was the first modern general to fully grasp this strategy. Sherman equated his campaigns in 1864-65 as great raids, emphasizing movement and the capture of strategic economic and command-and-control positions over the destruction of enemy armies. Sherman's model was Confederate General Nathan Bedford Forrest. Carr describes how Sherman became the model for World War II tank commanders Erwin Rommel for Germany and George S. Patton for the U.S. But Sherman's goal of breaking civilian morale translated into wholesale civilian slaughter at the hands of World War II's air marshals, such as Sir Arthur "Bomber" Harris in Great Britain and General Curtis LeMay in the U.S. Their legacy became Dresden and Tokyo where tens of thousands of civilians died under their high explosives and napalm. Again, not Sherman's way of war. Carr has written an anti-military military treatise. What holds true from Sherman's time to the present, Carr concludes, is "the continued acceptance of this principle of collective responsibility by both state armies and 'non-state' actors." Sherman's willingness to wage against civilians as well as armies is his real legacy for modern warfare. How it will morph in future conflicts is limited only by man's ability to imagine and conceive ways of inflicting destruction and death. Sherman's ghosts will continue to haunt because, as he prophetically said, war is "part of the grand machinery by which this world is governed." War is part of us.